Toys R Us in the UK and electronics chain Maplin are on the brink of collapse, putting 5,500 jobs at risk. Two of the UK's best known retailers - are understood to have put administrators on standby after struggling to secure a rescue deal. Maplin who are owned by Rutland Partners had tried putting the business up for sale, but talks with a potential buyer are understood to have failed. Toys R Us was also seeking a possible sale but has failed to secure a buyer. 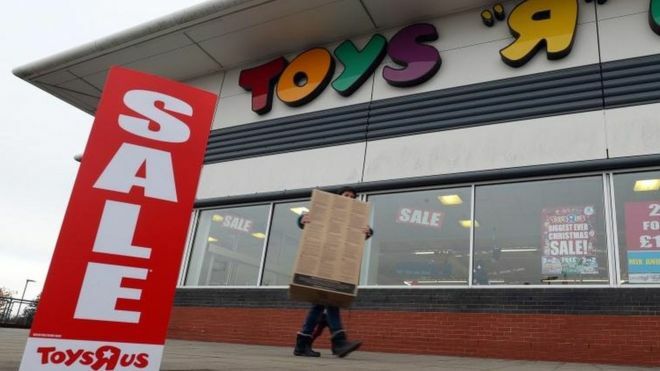 The UK toy chain US owner filed for bankruptcy protection last September is facing an imminent deadline for a £15m VAT bill which meant it will have to sell the business to be able to pay. In December it managed to stave off collapse by agreeing a rescue plan to allow it to restructure its operations, including the closure of at least 26 stores planned for this Spring. Toys R Us in the UK blame its problems on its "warehouse-style stores" which opened in the 1980s and 1990s, but it said in December that they had become "too big and expensive to run in the current retail environment". After Maplin's falling profits and breakdown of the sale talks means that administration is now the most likely outcome for the firm. The BBC reported that Retail analyst Kate Hardcastle, from Insight With Passion, saying both Toys R Us and Maplin had cut staffing to try to cut costs, which had led to poor service in the shops. She said for Toys R Us, the problem was particularly acute because it sold mainly branded goods. "Therefore to succeed you need to offer some kind of differentiating factor - either a good discount or an experience that makes visiting the stores worthwhile. "Toys R Us didn't move with the times. It didn't do discounts or retail theatre," she said.